Dexter Ward is a character in a novel written by HP Lovecraft in 1927. 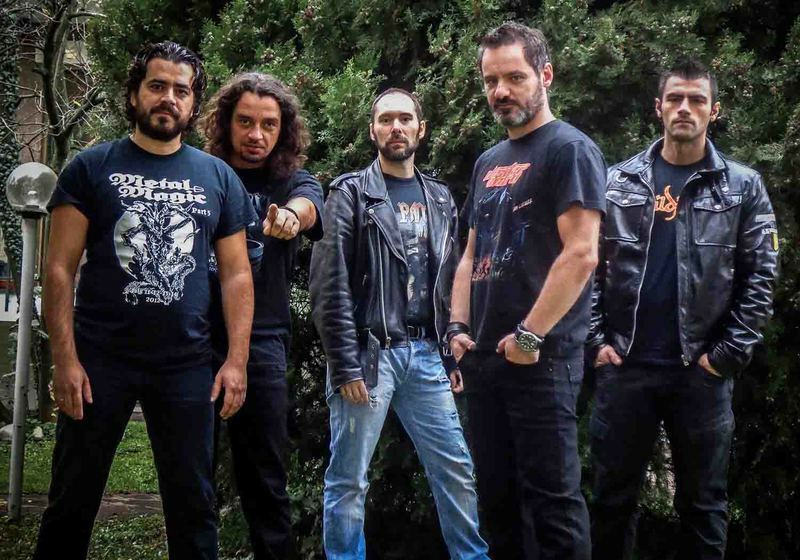 After three successful studio albums with BATTLEROAR, and several live shows all over Europe, including the participation in festivals such as Keep It True, Headbangers Open Air, Swordbrothers and March Metal Day, where the band shared the stage with acts such as MANOWAR and RHAPSODY, in the year 2009 Mark Dexter and Manolis Karazeris decided to form new band. Its name, DEXTER WARD, was taken from the short H.P. Lovecraft novel titled "The Case Of Charles Dexter Ward".Long time friends and fellow Heavy Metal brothers Akis Pastras (guitars) and John Luna Tsimas (bass) promptly joined their quest, and with Aggelos Tsoukalas (from BLOODSTAINED) on board, the band recorded and released the limited promo CD in 2010. Later that Iron On Iron Records released the "Antarctic Dream" 12" vinyl EP, which featured three tracks from the mentioned promo release, as well as live version of the CIRITH UNGOL classic "Go It Alone". One year later the band released its debut album titled "Neon Lights", which has been promoted on live shows in both Greece (opening for CRIMSON GLORY and VIRGIN STEELE) and in other European countries.In 2013 the band inked the deal with No Remorse Records, and released the "Stars And Stripes" 7" single, where the title track has been coupled with a cover version of the LORD song titled "Leather Queen". One week after the release of the single, the band played two shows as the support act of another US Metal legend: WARLORD. 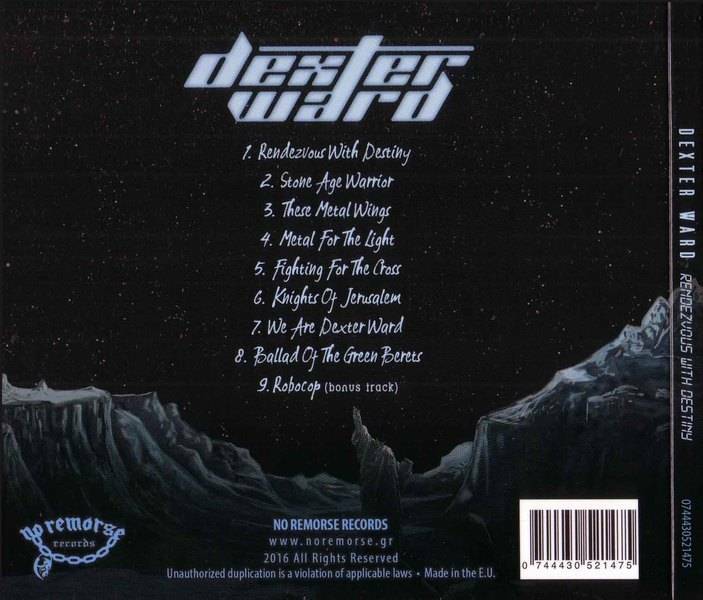 Few months later new DEXTER WARD recordings saw the light of the day, as the band joined the WARLORD and ANVIL tribute albums.In 2014 and 2015 the band was busy with both live shows (incl. opening for JAG PANZER in Athens), and in the studio: in April of 2015 the band released the limited edition 12" split album with their label mates BLACK SOUL HORDE, where the DEXTER WARD side was opened with the title track from their forthcoming album "Rendezvous With Destiny", and where the band also included 3 alternate versions of the songs already known from the "Neon Lights" album. After playing at the Up The Hammers Festival, and sharing the stage with cult acts such as MANILLA ROAD, OMEN or TITAN FORCE, the band joined the RIOT tribute album, and then focused on the new studio album. "Rendezvous With Destiny", as this is the title of their new, full length released at Keep It True Festival in Germany, on April 29, 2016. What is it with heavy metal bands and a fondness for H.P. Lovecraft and his writings? Athens band Dexter Ward takes their name from a Lovecraft character in The Case Of Charles Dexter Ward. So with their second album, Rendezvous With Destiny, what's there heavy metal sound? 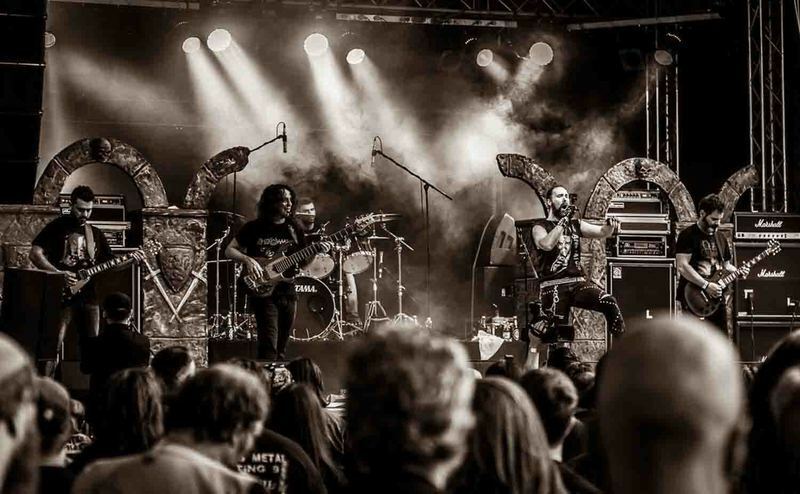 Founders vocalist Mark Dexter and guitarist Manolis Karazeris came from Battleroar, that should give you some clue.Dexter Ward and Rendezvous With Destiny is basically straight up European melodic heavy power metal. There's no guess work as to what goes into their musical presence. Large and harmonious riffage from twin guitars, which always lead to ripping solos. A rhythm section of some power, working that balance between power, thunder, and gallop. The final part of the triumvirate is Dexter's generally melodic and clean vocals, backed up often band gang vocal arrangements. The result is bombastic,roaring, and rather epic sounding melodic power metal, and all down without synths (as far as I could hear).As for the songs, for the most part each one puts the aforementioned elements into every arrangement and then races from the gates. There are some nuances here and there. One is the rather benign and quiet start in the first half of Metal For The Light, yet this turns to bombastic power metal for the latter half, before ending with an acoustic guitar outro. Shortly after the mid-point of self-gratifying tune We Are Dexter Ward, there's a nice breakdown of subtle guitar over rippling drum and bass work. But that's the say that the bass and drum work are quite present throughout, thanks not in the least to good mixing and mastering.The most curious song here is the cover of Ballad Of The Green Berets. If you're not an American and not familiar with our Vietnam War, you may not recognize this song. It was written by Robin Moore and Staff Sgt. Barry Sadler, a Viet Nam war veteran, who recorded it has a single. Later it was popularized in a choral version in the John Wayne film, The Green Berets, based on Moore's book of the same name. All that to say this, Dexter Ward to a power metal version of the song, and you can barely pick up the melody. 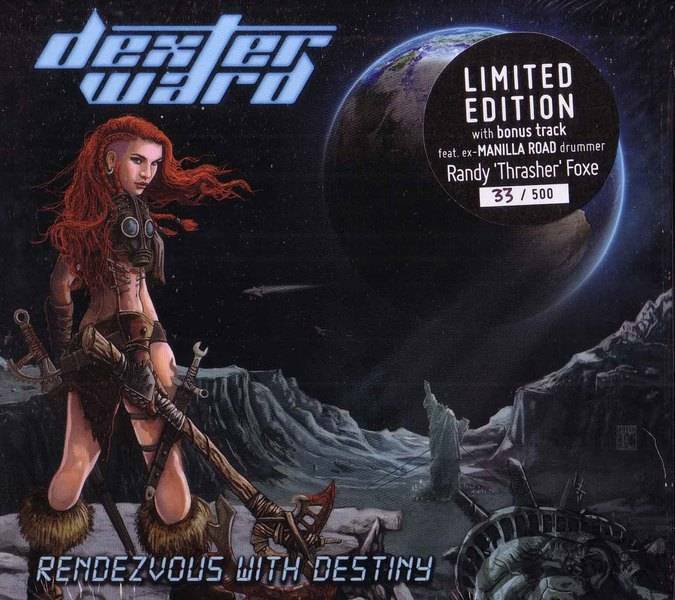 You'll have to listen the original version and then Dexter Ward's version to catch the musical theme.Bottom line: Dexter Ward's Rendezvous With Destiny is solid and entertaining "keep it true" melodic heavy power metal. If that's your thing, you will not be disappointed in the least. Recommended.